EU Gives Poland One Month Ultimatum, Threatens With "Article 7 Procedure"
The Vice-President of the European Commission, Frans Timmermans, escalated the diplomatic row between Brussels and Warsaw on Wednesday when he said that the EU was launching legal infringement proceedings and giving Warsaw a one month ultimatum over one of the recently passed reforms to Poland's court system, even as earlier in the week Poland's president Andrzej Duda vetoed two of the four controversial reforms to the judiciary. The EU has taken issue with one particular legislation because it introduces different retirement ages for male and female judges, which the Commission claims is a breach of EU anti-discrimination law. The law would see female judges retire at 60 and males at 65. As a result, Timmermans gave Warsaw a one month ultimatum to alleviate its concerns over the rule of law before deciding on whether it would "escalate proceedings." Timmermans also said the approval of the remaining measures still undermined the independence of the country’s judges in defiance of EU law. Brussels also sent a set of recommendations to Poland threatening that the country's voting rights could be suspended - under Article 7 of the EU treaty - if certain changes are implemented. Specifically, Polish authorities are warned not to take any measure to dismiss or force the retirement of Supreme Court judges. “In this past week some things have changed in Poland and some have not”, said Mr Timmermans. Any move from Poland’s ruling Law And Justice Party (PiS) to force the resignation of the country’s judges would have the EU stand “immediately ready to trigger the Article 7 procedure”, added the commissioner. Invocation of Article 7 of the EU’s treaties would result in a formal warning to Warsaw – an unprecedented move that has yet to be taken against a member state government. President Duda’s decision to block a portion of the reform bill followed mass public protests against the government’s attempt to take control of the judiciary. Of the two bills that have passed, one will hand power to Poland’s justice minister, who is also the prosecutor-general, to fire heads of the country’s lower courts. This bill has yet to be formally enacted, meaning the commission cannot start proceedings to challenge it in court. But Brussels can “pre-authorise” a challenge in the event that any of the bills is formally enacted during the commission’s summer break. “The Commission’s hand is still extended to the Polish authorities, in the hope of a constructive dialogue”, added Mr Timmermans. 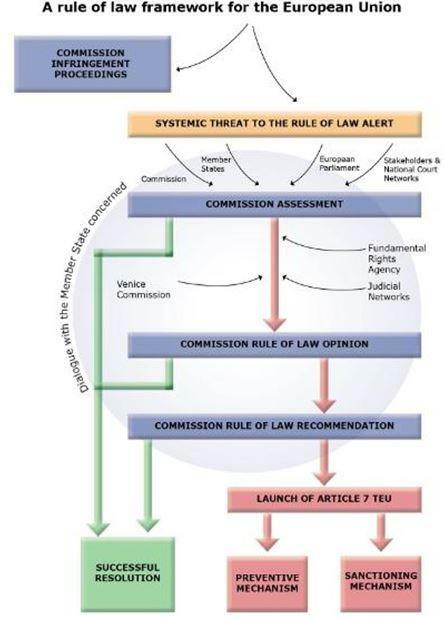 Article 7.1 of the Treaty on European Union provides for the Council, acting by a majority of four fifths of its members, to determine that there is a clear risk of a serious breach by a Member State of the common values referred to in Article 2 of the Treaty (see Annex II). The Commission can trigger this process by a reasoned proposal. The full European Commission press release "European Commission acts to preserve the rule of law in Poland" can be found here.